DJ Mag has announced the results of the Top 100 DJs Poll 2017, with Martin Garrix crowned as the world’s No.1 DJ for a second consecutive year. 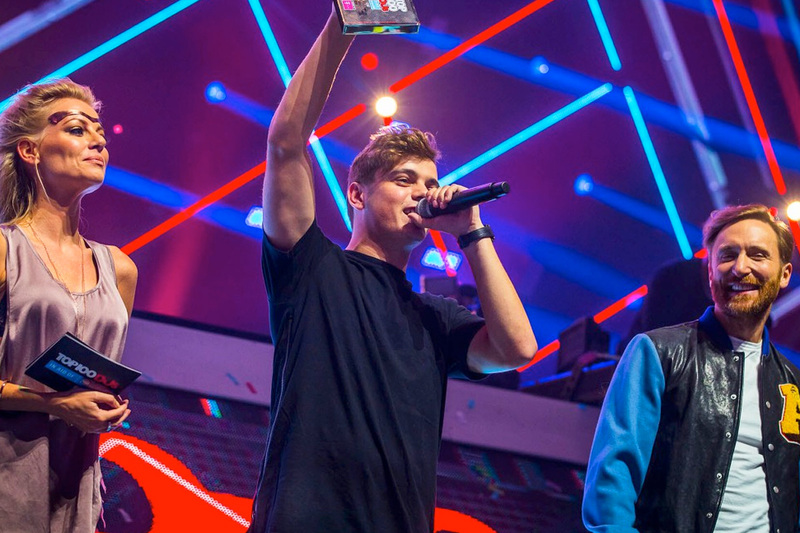 Garrix received the award at the Top 100 DJs Awards ceremony at AMF 2017 at Amsterdam ArenA; and was joined onstage by the Highest Duo, Dimitri Vegas & Like Mike (No.2), and Armin van Buuren (No.3), the Highest Trance DJ. AMF 2017 also featured an exclusive back-to-back performance by Armin van Buuren and Hardwell during the #TwoIsOne showcase, with further sets from David Guetta, Dimitri Vegas & Like Mike, Marshmello, Don Diablo, and many more. The Top 100 DJs Poll 2017 had over a million votes again this year, a marginal increase on 2016’s record-breaking 1 million figures. The most votes came from the USA, followed by Brazil, Mexico, Netherlands, India, UK, Spain, Italy, France, Belgium, China, Germany, and Japan. There were 15 new entries, 7 re-entries, and 5 non-movers. With Martin Garrix voted the world’s No.1 DJ for a second year, Dimitri Vegas & Like Mike have hung onto the No.2 spot, while Armin van Buuren is back up to No.3 — a spot he held for several years in the mid-Noughties before rising to No.1 for a record-breaking five times. Armin leapfrogs his sometime #TwoIsOne partner Hardwell — another former winner — while Tiesto, David Guetta, Afrojack and Steve Aoki all hold steady in the Top 10. The Chainsmokers jump 12 places into the Top 10 at No.6, while Marshmello is up 18 to No.10. Just outside the Top 10, Don Diablo is the Highest Future House DJ, and Skrillex is still the Highest Bass DJ despite moving down seven places. Alan Walker — the UK-born, Norway-raised DJ/producer is the Highest Climber, up 38 places to No.17. The Top 100 DJs Poll 2017 further opened up the voting process to Chinese dance music fans via a fully updated and translated validation mechanism. China’s electronic music scene continues to grow at a rapid pace, and Chinese DJs, DJ L and Carta, both from Shanghai, have made their Top 100 debuts this year, alongside 15 new entries in the Top 100, with Lost Frequencies from Belgium the Highest New Entry. Other new names to the Poll include Mike Williams, Julian Jordan and Lucas & Steve, but the big story for this year’s Poll is the rise of ‘non-EDM’ DJs. Solomun has a debut chart placing at No.81, while Maceo Plex charts ten places lower, and South African hero Black Coffee debuts at No.85. Also bridging the gap between the underground and the mainstream, Eric Prydz has had a good year, he’s up 32 places to No.34. Claptone is also a new entry at No.69, as is Australian DJ, Alison Wonderland (No.89). Richie Hawtin returns in the Poll at No.80 after slipping out in 2016, but Carl Cox is once again the Highest Techno DJ — up 12 places to No.62. Paul Kalkbrenner is back in the Top 100 for the first time since 2012, while in the next 50 places (101-150), Loco Dice, Marco Carola, Adam Beyer, Jamie Jones, Green Velvet, Seth Troxler, Nina Kraviz and Kolsch all make an appearance. Disclosure have returned to the Top 100, and Andy C — once again the Highest Drum & Bass DJ in the Poll — has reaped the rewards of a hectic year by double-dropping himself back in at No.77. Nervo are once again the Highest Female DJs, while Mexico’s Mariana BO, in at No.84, joins the aforementioned Alison Wonderland and Nina Kraviz, and hard techno spinner Miss K8 from Ukraine, who is up 30 places. The Top 100 DJs Poll used to be dominated by trance DJs until the rise of EDM a few years back, but it seems like the sound is having a resurgence. Not only is trance figurehead Armin van Buuren up, but former winner Paul van Dyk is up nine places and the Above & Beyond trio are up twenty places off the back of their huge arena shows. ATB is also up to No.54, while Ferry Corsten jumps up nine places in the wake of his ‘Blueprint’ album. There’s still a smattering of hardstyle DJs in the hallowed hundred, and Angerfist has had to surrender his Highest Hard DJ hat to Headhunterz, who’s returned to the hardstyle scene after a spell exploring more mainstream music. Unicef, the global children’s organization, is the Top 100 DJs charity beneficiary for 2017. Unicef works in over 190 countries around the world to keep all children healthy, happy and safe. They ensure more of the world’s children are vaccinated, educated and protected than any other organisation.